At the invitation of State Councilor and Foreign Minister Wang Yi, Minister for Foreign Affairs and Trade of the Independent State of Papua New Guinea Rimbink Pato will visit China from April 10 to 15. During Foreign Minister Rimbink Pato's visit to China, State Councilor and Foreign Minister Wang Yi will hold talks with him. The two sides will exchange views on China-Papua New Guinea relations and the international and regional issues of mutual interest. Over the past 42 years since the establishment of diplomatic ties, China-Papua New Guinea relations have achieved considerable development, thanks to the concerted efforts of the two sides. In particular, under the guidance of the important consensus reached by President Xi Jinping and Prime Minister Peter O'Neill in November 2014 to establish a strategic partnership featuring mutual respect and common development, China-Papua New Guinea relations have entered a new stage of rapid development. This November, President Xi Jinping will travel to Papua New Guinea to attend the APEC Economic Leaders' Meeting, which will offer important opportunities for the further development of China-Papua New Guinea relations. China is willing to work with Papua New Guinea to sustain the momentum of exchanges at the high level and all the other levels, deepen all-around mutually beneficial cooperation, strengthen communication and coordination on international and regional affairs and strive for the greater development of China-Papua New Guinea strategic partnership. Q: Is China currently in formal negotiations with the US over trade issues? And how are such talks progressing? A: Like I said yesterday, we are always open to having dialogue and negotiation. In fact, China and the US have been in talks on the relevant issue. I am honest with you that in pursuing dialogue and consultation, China is 100% sincere and has done enormous work. However, the US side has been missing one opportunity after another to properly resolve the relevant issue through talks. We hope that the US side could have a clear understanding of the current situation, remain level-headed, listen to its business community and general public, discard unilateralism and trade protectionism as soon as possible, and work with China to resolve trade disputes through dialogue and consultation. Meanwhile, the consultations we are talking about here are ones based on international law and international trade rules, not on some domestic law of the US side. And parties to such consultations shall treat each other with respect and equality and demonstrate mutual understanding and willingness to compromise, instead of one party condescendingly issuing threat and making unreasonable demands to the other. Q: Yesterday, State Councilor and Foreign Minister Wang Yi said that Chinese President Xi Jinping will attend the opening ceremony of 2018 Boao Forum for Asia (BFA) annual conference, during which he will talk about how China will deepen its reform and opening-up, and introduce a host of new reform measures. Do these measures have anything to do with the recent trade frictions between China and the US? 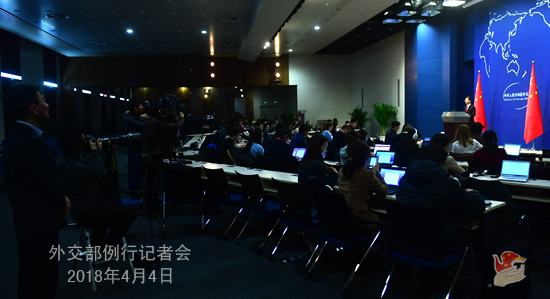 A: Yesterday, when holding the press briefing on the 2018 Boao Forum for Asia (BFA) annual conference, State Councilor and Foreign Minister Wang Yi said that President Xi Jinping will attend the opening ceremony of 2018 Boao Forum for Asia (BFA) annual conference upon invitation and deliver a keynote speech. He will meet with heads of state, government leaders and senior officials of international organizations. President Xi will also have a group meeting with the BFA board members and hold discussions with the representatives of Chinese and foreign entrepreneurs. President Xi Jinping will give the most authoritative account of how will China open wider to the outside world and conduct a new round of in-depth reform. We have said many times that China owes its great achievements scored over the past four decades to reform and opening up. Openness has propelled forward our reform and development cause. China will unswervingly stay committed to the basic state policy of opening up, and China's door to the outside world will open wider and wider. China will pursue opening-up in accordance with its own needs and follow a timetable and road map devised by itself. China's opening up will bring more development opportunities to the world. Meanwhile, just as State Councilor Wang Yi said, China is willing to share development opportunities with other countries, but whoever pursues protectionism will end up having a dose of its own medicine, as its action amounts to shutting itself out of China. Q: Do you have any further comment to the US list? 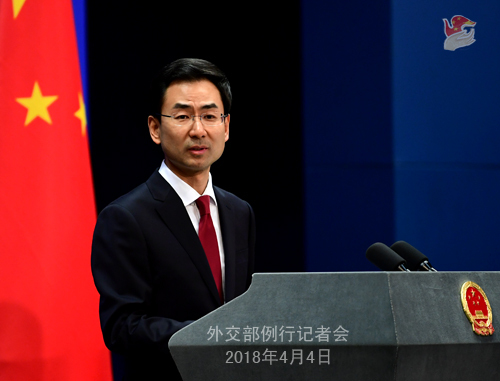 China said that it will immediately refer this to the WTO dispute settlement mechanism. Does that mean that China has initiated this process? If not, when are you planning to do it? A: On April 3, EST, the US side released a proposed list of Chinese products that could be subject to additional tariffs pursuant to Section 301 investigation. China's Ministry of Commerce, Ministry of Foreign Affairs, the Chinese Embassy in the US and the Chinese Permanent Mission to the WTO have respectively made their responses to this issue. For some time, the Chinese side has been reiterating its opposition to the US unilateral and trade protectionist behaviors and firm determination to safeguard our own legitimate rights and interests. So, enough with all the talking, now is time to get something done. As for the specific details you asked, I believe the answer will be clear very soon. Q: According to reports, the proposed tariff list on Chinese products released by the United States under Section 301 Action is mainly aimed at the fields which can benefit from the "Made in China 2025" strategy. Before this, Peter Navarro, the director of the White House National Trade Council said that the US is highly concerned about the "Made in China 2025" strategy and that the relevant measures taken by the US also target the "Made in China 2025" strategy. What is your response to this? A: The "Made in China 2025" strategy aims to transform China from a big manufacturing country into a strong one. Our goals and measures, written in black and white, are open and transparent. It is beyond reproach that China wants to strengthen its own manufacturing capability. Actually, other countries also have similar strategies and measures, for example, Germany's Industry 4.0 Strategy. On this front, all countries can compete with each other, and as long as such competition is conducted in a fair and healthy way, it will fuel the development of relevant industries and people around the world stand to benefit from this. The US leads all others in the scientific and technological strength and manufacturing capability. It should have been more confident with itself and competed with all others in an open and honest way, rather than resorting to unilateralism and protectionist measures to undermine and disturb other countries' efforts. As a Chinese saying goes, pressure can be turned into motivating force. I am convinced that under the current circumstances, the Chinese people's wisdom and vigor will be further motivated and "Made in China 2025" strategy will only proceed in a faster pace and produce greater outcomes. Q: According to reports, Madame Anna Chan Chennault, the widow of Lieutenant General Claire Lee Chennault who headed the wartime Flying Tigers pilots, passed away on March 30. What is your comment? A: Madame Anna Chan Chennault had been devoting herself to promoting friendship, exchanges and cooperation between the Chinese and American people. We deeply mourn for the passing away of Madame Anna Chan Chennault and convey our sincere condolences to her family. Q: Amnesty International has accused a Chinese mining company of violating Mozambican laws on environmental evaluation in its operations in the Mozambican province of Nampula which caused environmental degradation and affected the lives of local people. What is your comment? A: We have noted relevant information. I want to point out that this organization in question here is always biased against China, with its regular utterance of irresponsible remarks targeting China. Its report has not the slightest credibility to speak of. Mozambique is China's traditional friend and comprehensive strategic partner for cooperation in Africa. China is Mozambique's largest investor. In recent years, the two sides have conducted fruitful cooperation in various fields which delivered tangible benefits to the two peoples and won acclaim from Mozambique. The Chinese government always asks its enterprises overseas to strictly follow local laws and regulations, feed back to the local society, and work for win-win outcomes. China stands ready to work with Mozambique to further promote the sound and steady development of bilateral cooperation. Q: In response to Section 301 investigation, China said that it will reciprocate and take corresponding measures. Can you say what those measures will be and when those measures will be announced? A: Regarding this proposed list, China will immediately refer this behavior by the US side to the WTO dispute settlement mechanism. Meanwhile, in accordance with the relevant stipulations of the Foreign Trade Law of the People's Republic of China, we will take proportionate measures of the same intensity and scale on US products. I said yesterday that the US has its list, we have our own. And no need to rush because our list will come very soon, maybe sooner than you expected. Q: Is there an upper limit to China's reciprocal response? Is there a place that China wouldn't consider further actions against the US? And does China worry about the implications of an escalating trade war for its economic growth? A: I believe I have made it clear that China will take proportionate measures of the same intensity and scale on US products. I also just assured you that the list will soon be released, maybe sooner than you expected. You know what I mean, right? As for how the US measures will impact China, we talked over this many times. No one will emerge victorious from a trade war, because the initiator will end up hurting himself while harming others. It is the very interests of the US side that will bear the brunt of its own measures. We have noted that the US business community, its consumers, media, and think tanks have expressed concerns regarding this move and the severe consequences it entails. Lots of other countries and international organizations have voiced their concerns and opposition to such unilateral and trade protectionist behavior. We hope that the US could pay attention to these reasonable and practical opinions, stop its wrong action as soon as possible, and return to the right track of dialogue and consultation to realize win-win cooperation. As for how China's economic development may be affected, I can tell you that some impacts will be expected, but we will have no problem dealing with them.The past 40 years of China's reform and opening-up is a history of how we have been countering various challenges, difficulties, disruptions and pressure, and how we have become stronger and more confident after going through all these. It has never worked to try to pressurize or intimidate China into submission, nor will that work this time. The Information Office of the State Council will hold a press briefing at 4:30 pm. Vice Minister Zhu Guangyao of the Finance Ministry and Vice Minister Wang Shouwen of the Commerce Ministry will be there to talk about China-US trade and take questions. 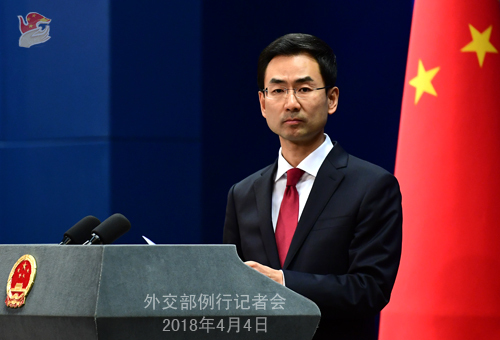 In accordance with the arrangement for the Qingming Festival (Tomb Sweeping Day), the regular press conference will be adjourned on April 5 (Thursday) and April 6 (Friday) and resumed on April 9 (Monday). The Foreign Ministry Spokesperson's Office will receive your questions through phones and faxes during the adjournment.